Put your feet up in your backyard, lawn, or patio on this classic Adirondack wooden outdoor ottoman. Designed with comfort in mind, this ottoman works well with other pieces of Adirondack furniture, or it can be paired with other styles as well. 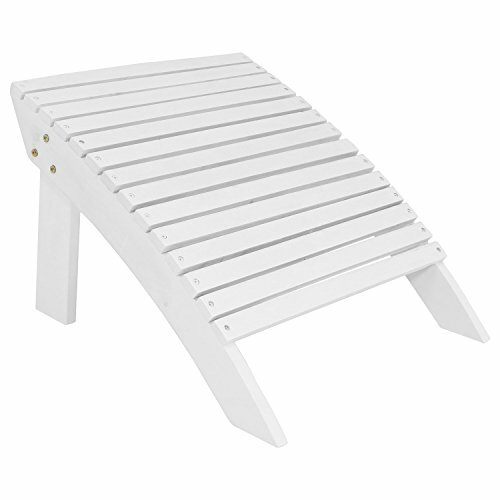 Easy to assemble, this outdoor ottoman does not require any additional staining or painting because it already has a non-toxic paint finish for a touch of color. This ottoman would make a great addition to your cabin getaway or beachside retreat. Relax in the comfort of your own backyard by placing this ottoman on your patio, porch, balcony, deck or anywhere else outdoors that you go to unwind and enjoy the peacefulness of nature.